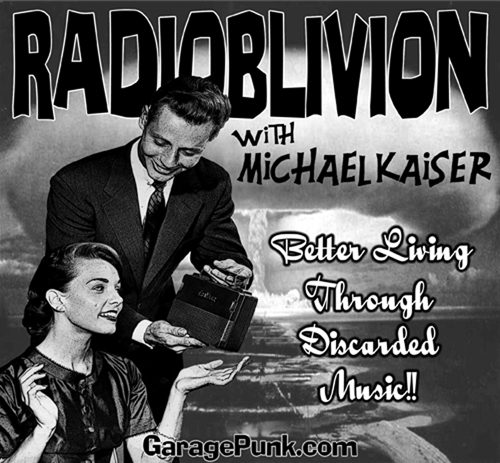 Get Wild & Primitive with Michael Kaiser on RadiOblivion eppy-sode 65... Troglodyte style! Pounders from Music Alley include: The Fast Takers, The Scrams, The Manxx, and Leroy Macqueen and the Gussets. Plus more killers from Voodoo Savage and His Savages, Boss Christ, The No-Talents , The Buff Medways , Thee Cormans, The Dukes of Hamburg , and more. Including the inter-galatic anthemic proclamation that "there's nothin' better than a box of records" by the enigmatic Guinea Worms!